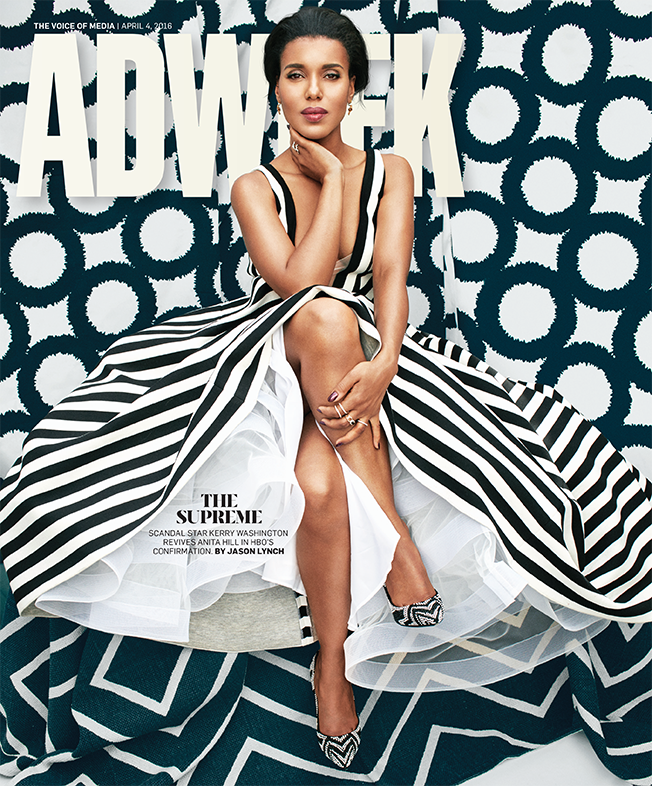 When she made her debut four years ago as ace D.C. crisis manager Olivia Pope on the ABC drama Scandal, Kerry Washington would not allow herself to dream that the show would ever become the hit that it is. "I didn't have a lot of expectations, to be honest," she admits. "It was a great thing, but I feel like expectations are resentments in waiting. But in a million years, I couldn't have expected the success of the show and the impact that it would have culturally in terms of fashion, changing language, images of gender and the landscape of casting in television." Nor did she anticipate the impact that Scandal—one of broadcast television's top 10 series in the 18-49 demo—would have on her career. The actress has secured partnerships with a variety of brands and causes—among them, Neutrogena, Movado, Apple Music and Hillary Clinton's presidential campaign. Now, add the job of producer to Washington's resumé. She not only stars in but is also an executive producer on the HBO original film Confirmation, premiering April 16, which revisits Supreme Court Justice Clarence Thomas' 1991 Senate confirmation hearings—an event that was dominated by the testimony and sexual-harassment accusations of his former assistant, Anita Hill (played by Washington). Here, Washington talks to Adweek about her hit show, the HBO project, how she helped pioneer the art of live tweeting TV shows, and why she refuses to be just a pretty face for brands. Why did Confirmation speak to you, as an actress and producer? I've been wanting to produce for some time because I want to have more creative control over the things that I do, and not be victim to the whims of other people's desires. This story resonated with me because I had really personal memories, not as much about the hearings themselves, because I was probably about 13 when it happened, but I had real memories about how it affected my parents, their feelings about the hearings. And it was one of the first moments that I was made consciously aware of my own identity intersectionality: the idea that there may be times that I feel passionate about something as a person of color, and there may be times that I feel passionate about something as a woman, and there may be times when those two things are at odds with each other. So it was a poignant moment in my own developmental understanding of who I was. Kerry Washington stars as Anita Hill in the new HBO movie Confirmation, which she also executive produced. Photography: Alexei Hay/Stockland Martel. Styling: Leslie Billings/ Walter Schupfer Management. Set design: Lauren Shields/ Halley Resources. Hair: Takisha Sturdivant- Drew for Exclusive Artists/Neutrogena. Makeup: Autumn Moultrie for Exclusive Artists/Neutrogena. Manicure: April Foreman for OPI/The Wall Group. Dress: Gauri and Nainika; Jewelry: Dolce & Gabbana, Ippolita. Shoes: Christian Louboutin. The film is filled with scenarios that will be familiar to Scandal viewers—you're facing off against D.C.'s power players, and surrounded by a pack of reporters—but your Anita Hill is nothing like Olivia Pope. How difficult was it to keep those performances distinct? One of the reasons I was drawn to the project was because even though the environmental context was similar, this is a woman who is on the opposite end of the spectrum in terms of access and power. That part of it was fascinating for me, to flip the circumstance upside down, to not be an insider. So because it was part of my fundamental understanding and part of what drew me to the project, it wasn't something that I felt like I had to baby-sit because there's nothing about this woman that is like Olivia Pope. It was really freeing for me to do something so different, and a little bit of a relief. I come from film where I only play a character for three months at a time and then it's done, so it's important for me to be able to put on other hats and make sure that all of the tools in my toolbox that don't apply to Olivia Pope are still in shape. In addition to producing Confirmation, you also developed a show for ABC this season. What have you learned from that process? And what other projects are you working on?